We have a new feature for Wednesdays to get you over the hump day in the week – Weird Weekend Wednesday. This week’s tale comes from the weekend before last and involved Weird Ben and…. THE CRANAGER??? We had just suffered our first defeat of the season at Raynes Park and had retired to the Raynes Park Tavern. The team stayed for a few drinks, but last season’s management (link to league table) decided to stay for a while. About six pints later, they decided to move things on to Earlsfield, where Ben decided that they had had too many beers and wanted a short. Not wanting to be outdone, The Cranager responded with the phrase “I want something shorter” and out came the Buca. Many hours later, and having been to more bars, they ended up at a house party. Where? Whose? How? These answers remain unanswered, but the point was they ended up there. Other details apparently are patchy at best, but it was the morning after that made it worthy of a blog. 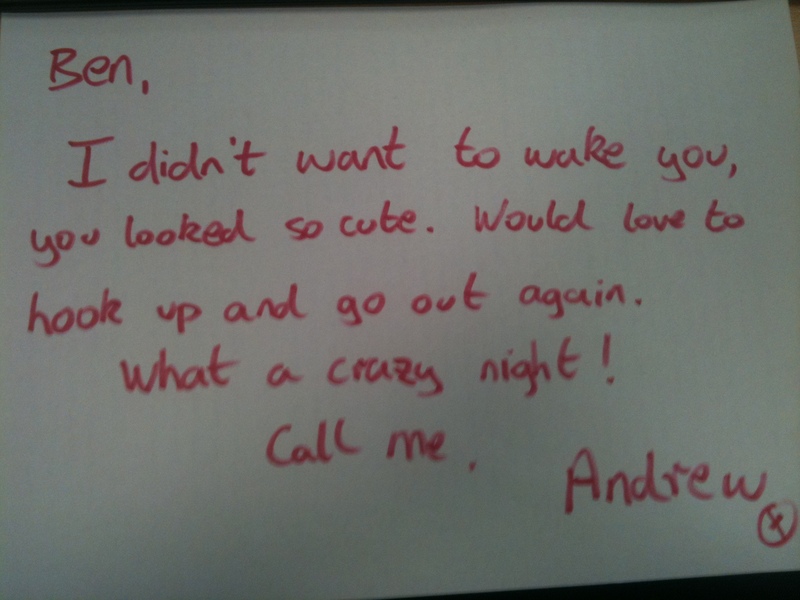 Who is Andrew? What happened to make it so crazy? Will they hook up again? Just another crazy night out, I guess… Hmmm….